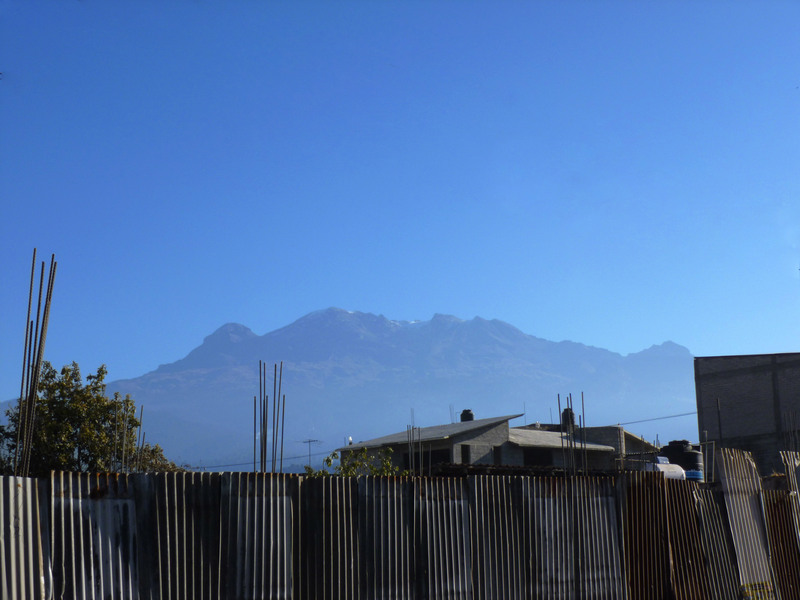 Iztaccihuatl, as viewed from the central square in Amecameca – the profile of the sleeping woman is clear in the photo: head and hair to the far left, legs and feet to the far right. 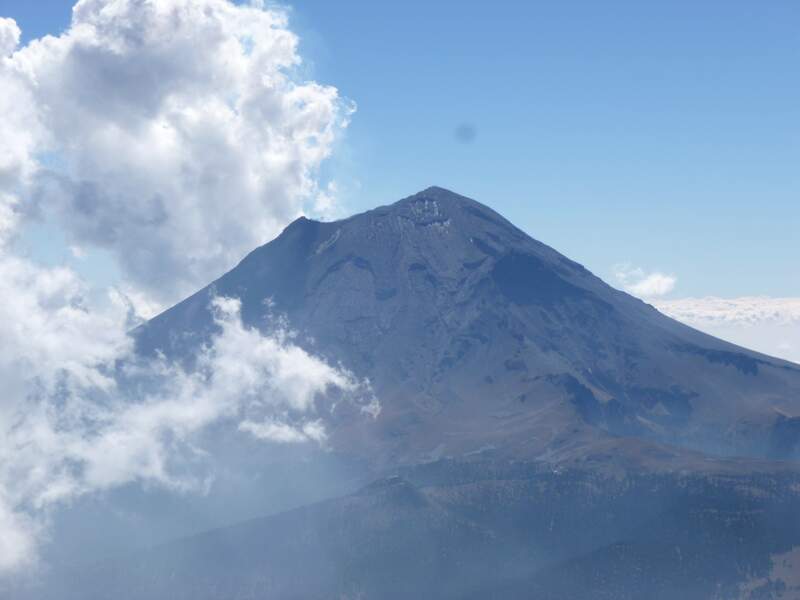 Iztaccihuatl is a 5230m dormant volcano, the third highest mountain in Mexico. The mountain’s name means ‘White Woman’ in Nahuatl, an Aztec language indigenous to central Mexico. From a distance the mountain’s profile resembles a sleeping woman, sometimes seen blanketed white with snow. 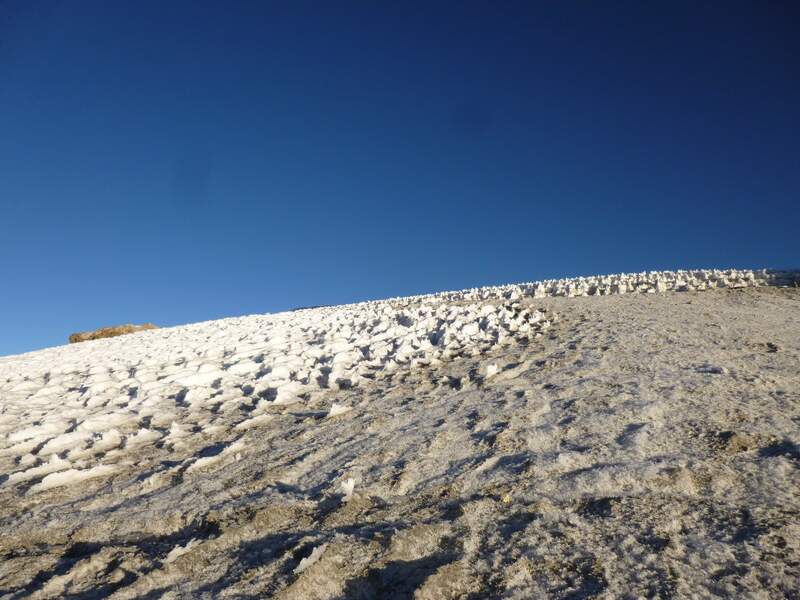 Climbing Iztaccihuatl is mostly a straightforward hike, with an uncrevassed glacier traverse near the top. Iztaccihuatl, viewed from near La Joya. 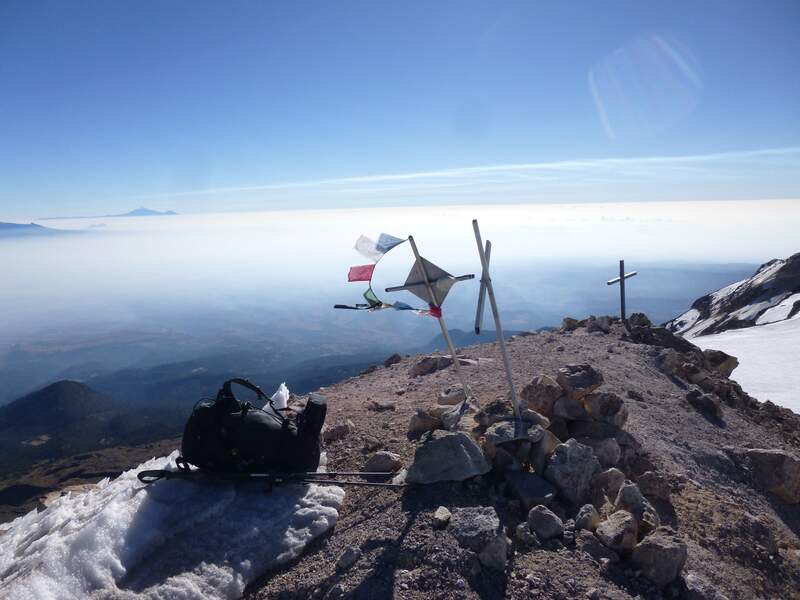 I hiked Iztaccihuatl over 3 days as warm up and acclimatization for Pico de Orizaba. 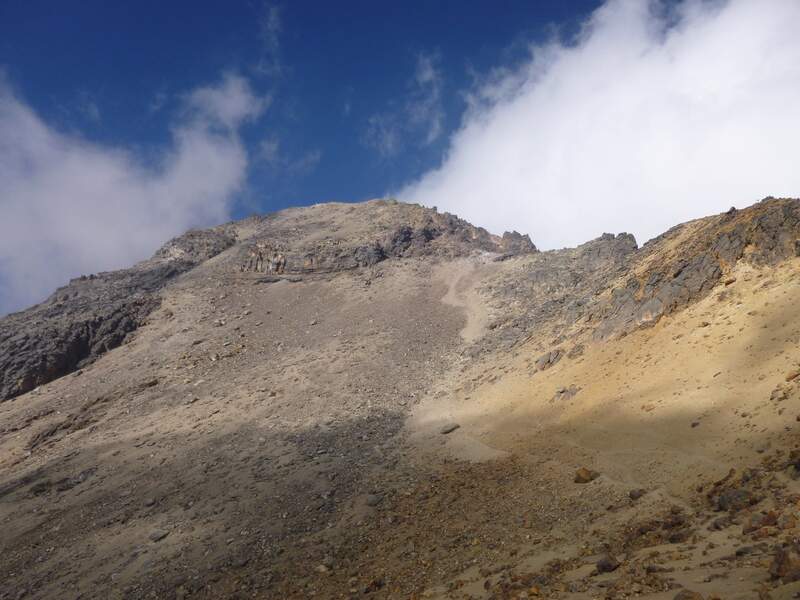 While the climb served this purpose wonderfully, Iztaccihuatl is a fantastic hike in its own right. 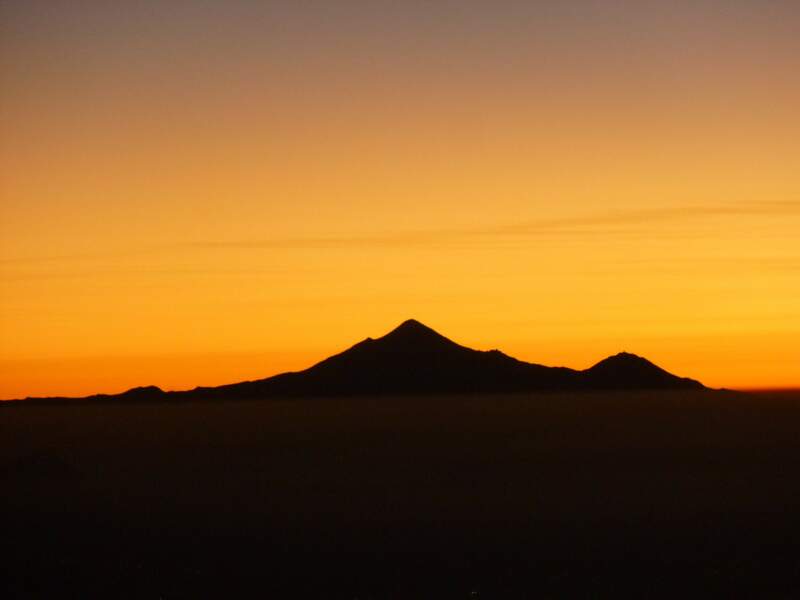 Popocatepetl (left) and Iztaccihuatl (right) on the horizon, as seen from the summit of Pico de Orizaba. 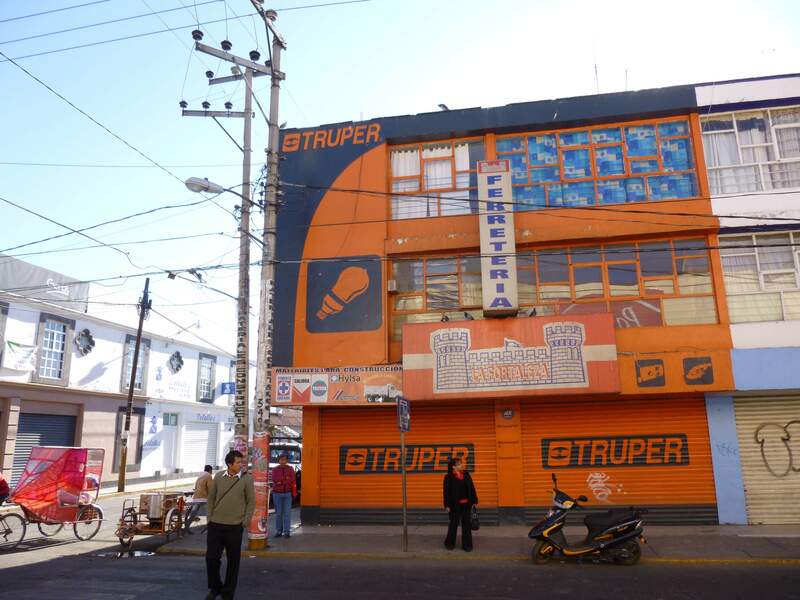 Day 0: My trip began in Mexico City, where a short taxi ride took me from the airport to the TAPO bus station. At the TAPO station I took a ~2 hour bus to Amecameca, a town near the base of Iztaccihuatl. 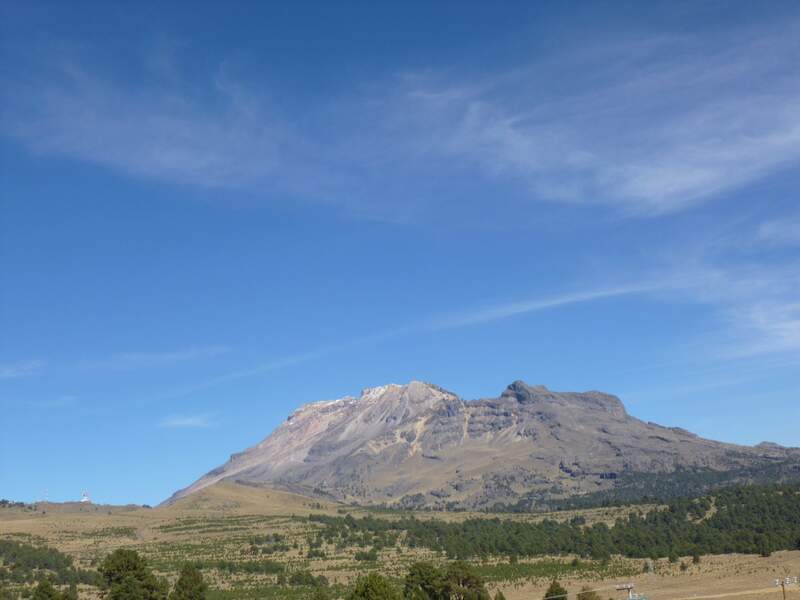 Amecameca sits at ~2450m, making it a good overnight acclimatization rest for someone coming from sea level, as I was. In Amecameca I walked from the bus stop to the central square and checked into the Hotel San Carlos, a budget hotel recommended by many climbing websites. For $10 per night, it also serves as excellent storage for luggage while on the mountain. 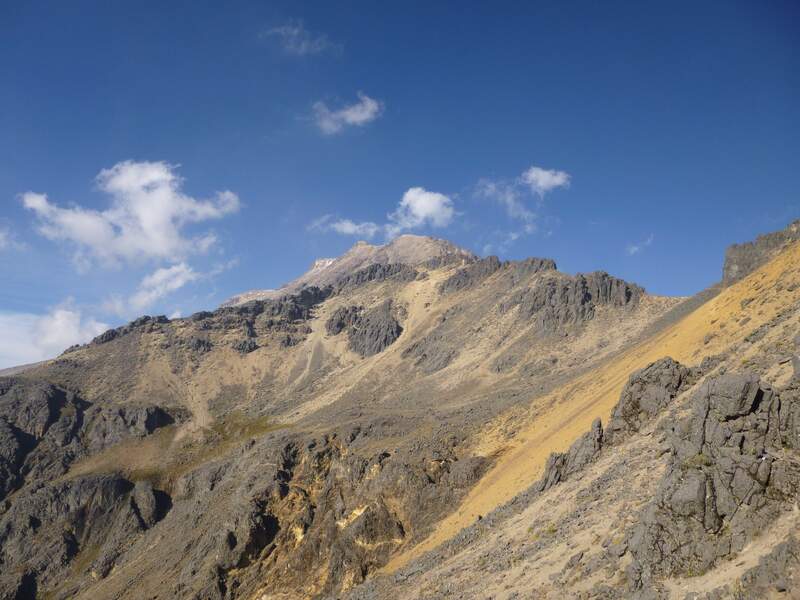 Equally convenient, the Hotel San Carlos is right next door to the Izta/Popo national park headquarters, where one must arrange an access permit to hike Iztaccihuatl. 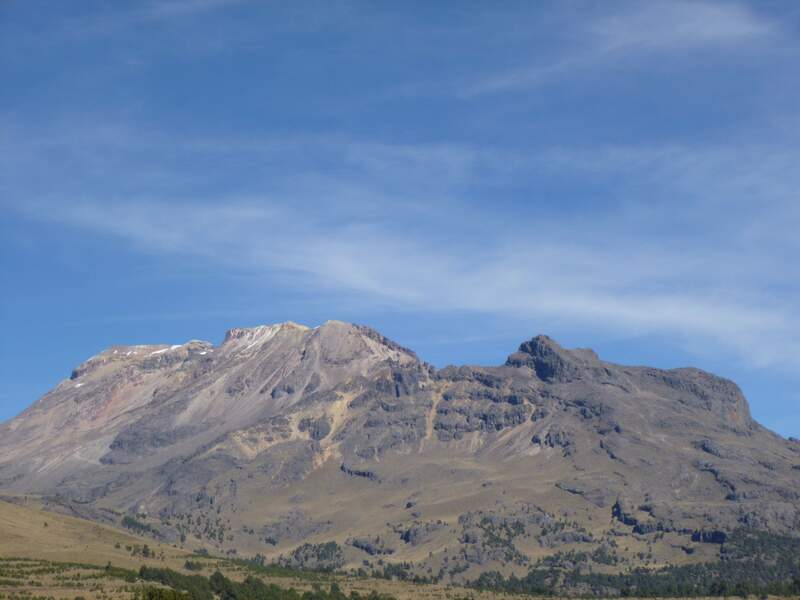 My plan for the next day was to hire a taxi to drive me to La Joya, the trailhead for “La Arista del Sol”, the ridge of the sun, the standard route up Iztaccihuatl. At check in the hotel owner asked me which country I came from, and when I told him I was Canadian he excitedly informed me that three other Canadians were also staying in the hotel and were planning to hike Iztaccihuatl the next day. I introduced myself to the trio in the morning, and we agreed to carpool to La Joya and hike together. 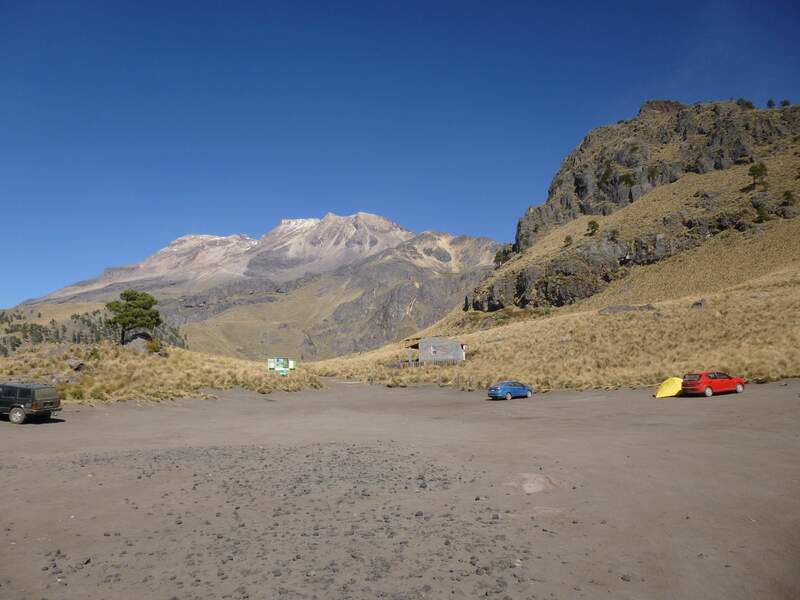 The parking lot at La Joya, trailhead for Iztaccihuatl’s La Arista del Sol route. 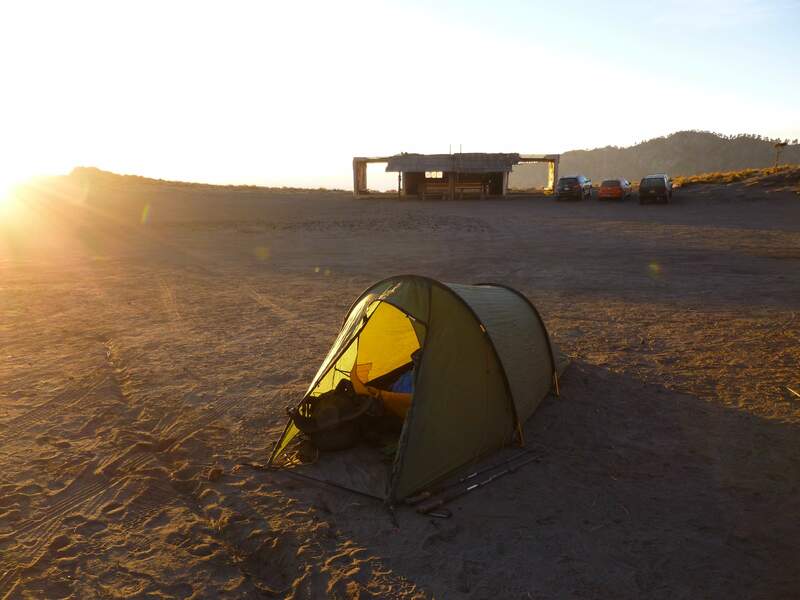 Day 1: After a rough drive out of Amecameca and up some steep switchbacks, we reached La Joya, a large open space at the base of the mountain – pretty much a big parking lot. 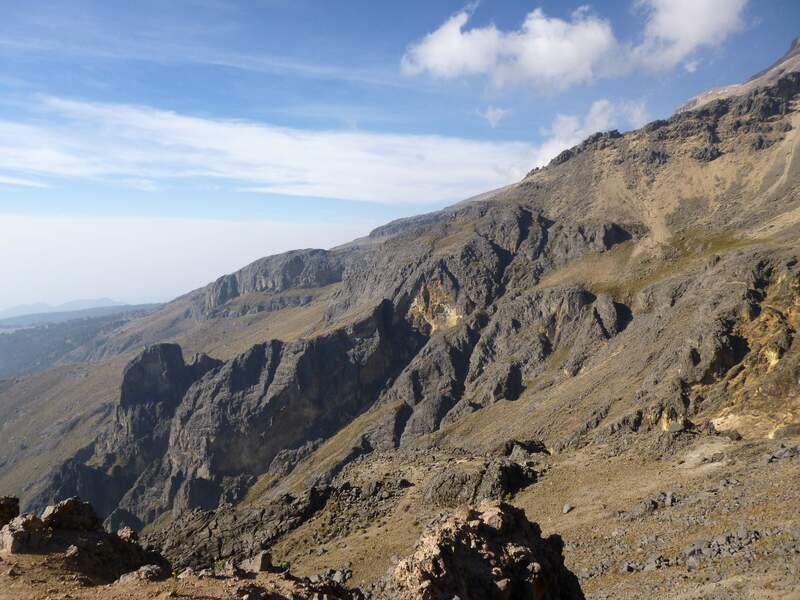 This is a good area to camp and rest, and a great acclimatization interval at ~3900m. After sorting some gear and hydrating, my new friends and I headed upward for an acclimatization hike. Iztaccihuatl sees a lot of traffic, and is quite a popular weekend hike for locals living near Mexico City. Near the La Joya trailhead are numerous memorials – many to famous Mexican climbers who have died on mountains around the world. Looking ahead, near the La Joya trailhead. 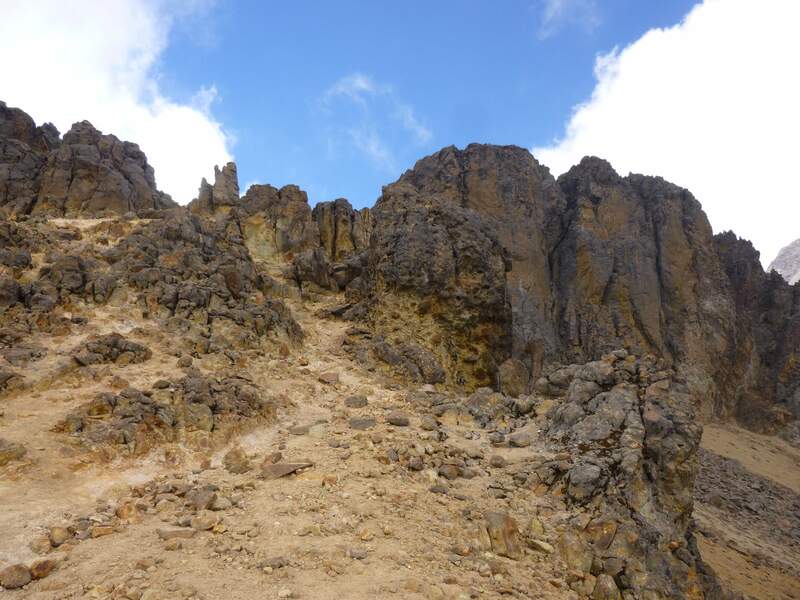 As we headed up the route followed a usage path of scree and volcanic rock. The terrain was interesting, with big rock formations and little vegetation. After an hour and a half of hiking steadily upwards, we stopped to take a rest. Higher up we had great views of Popocatepetl looming to the south. 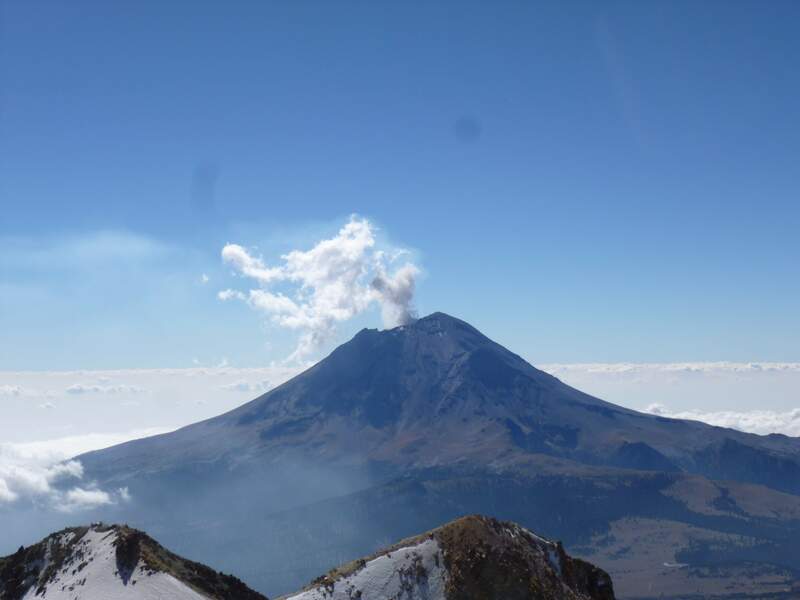 Popocatepetl is an active volcano, and lives up to its Nahuatl name, meaning ‘Smoking Mountain’. After a short rest for acclimatization, we descended to La Joya and pitched camp in the parking lot. My little campsite at La Joya. Day 2: Today we planned to hike up to our second overnight, the Grupo de los Cien climber’s hut at ~4600m. 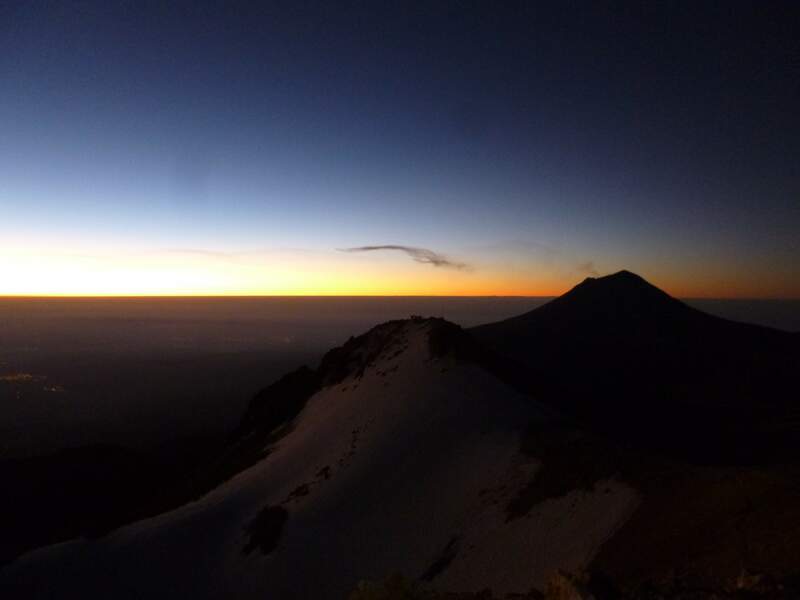 This second night at altitude is an important acclimatization interval – the summit of Iztaccihuatl is over 5000m, and I had recently come from sea level. We left La Joya early, carrying with us food and water supplies for the next two days. 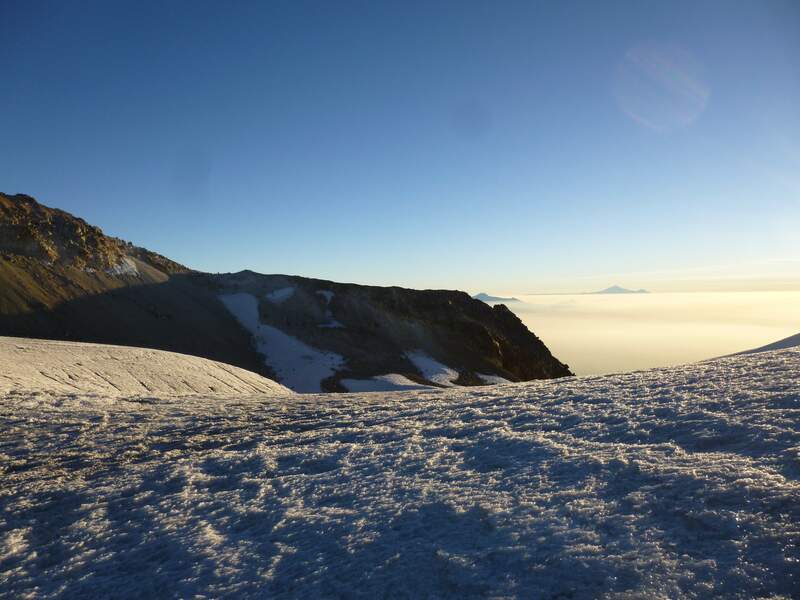 Iztaccihuatl is a dry mountain, and below the glaciers there are no water sources. 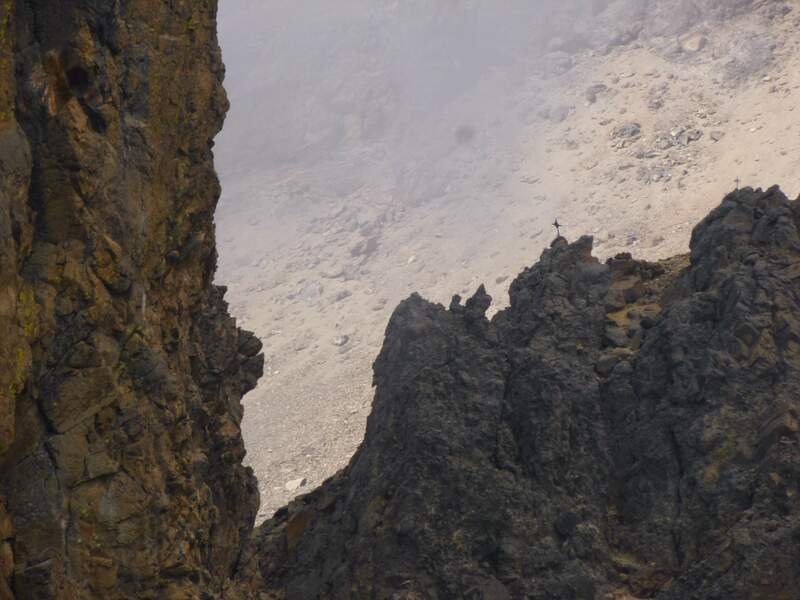 Heading up over volcanic rock and loose scree, a usage path was often visible. Just below the Grupo de los Ciens hut crosses stood on many of the rock spires above. I can only assume that these were more memorials, but their presence above us was somewhat chilling. Crosses on the rocks above. 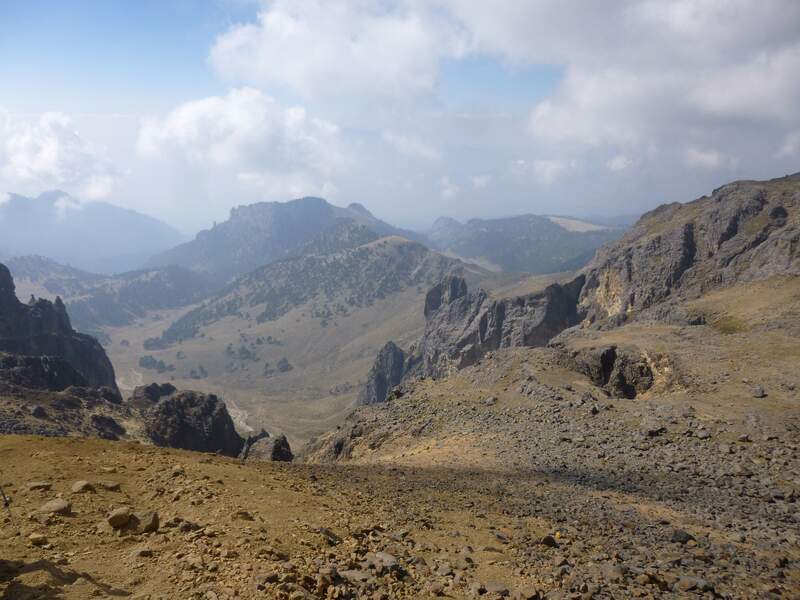 Finally we cleared a ridge and saw the Grupo de los Ciens hut below us. The Grupo de los Cien hut. 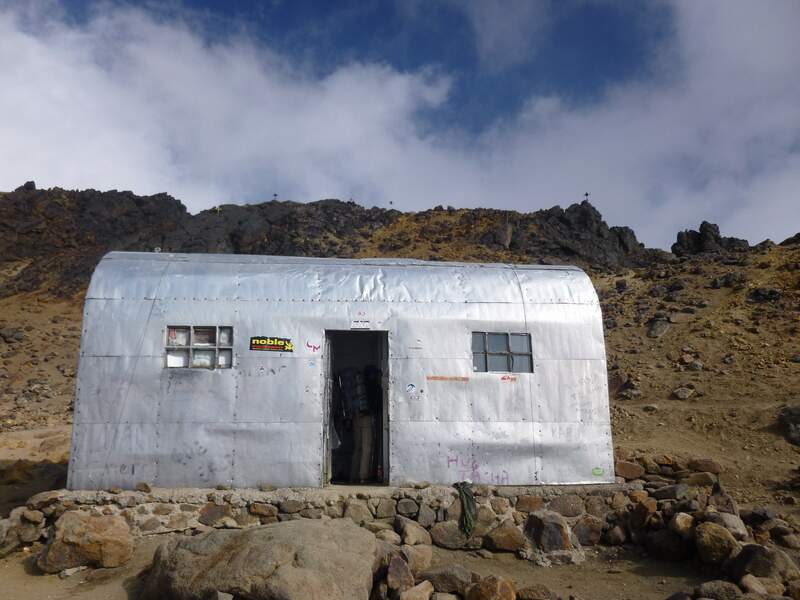 At an elevation of ~4600m, the hut serves as a rough overnight and an excellent high camp for a climb to Iztaccihuatl’s summit. 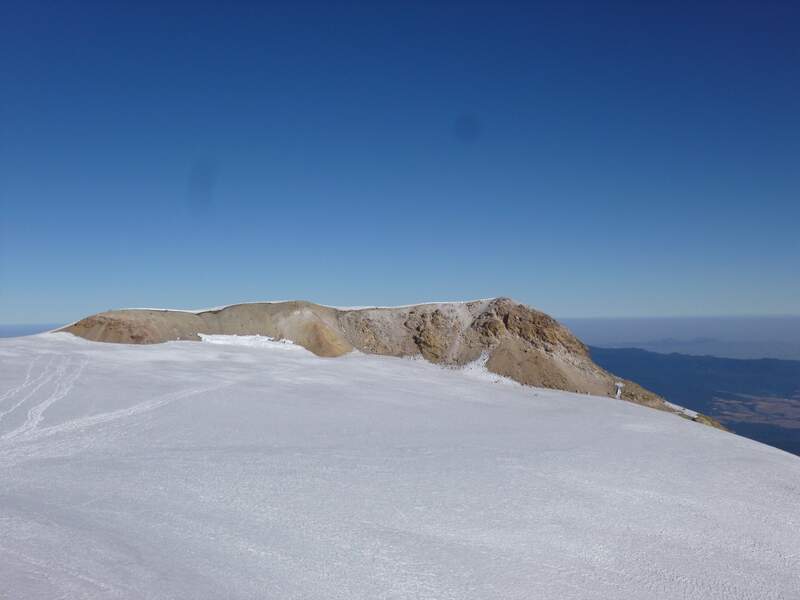 The hut is located just below the ‘knees’ of Iztaccihuatl, when considering the mountain’s sleeping woman profile. The Grupo de los Cien hut is nothing if not sturdily constructed. Crosses lined the rocks above the hut. Inside, we unpacked and began sorting gear for our overnight climb to the summit. Comfortably, the hut would accommodate around eighteen people. We had it mostly to ourselves, only sharing it with two others who were on their way down. Inside the Grupo de los Cien hut. 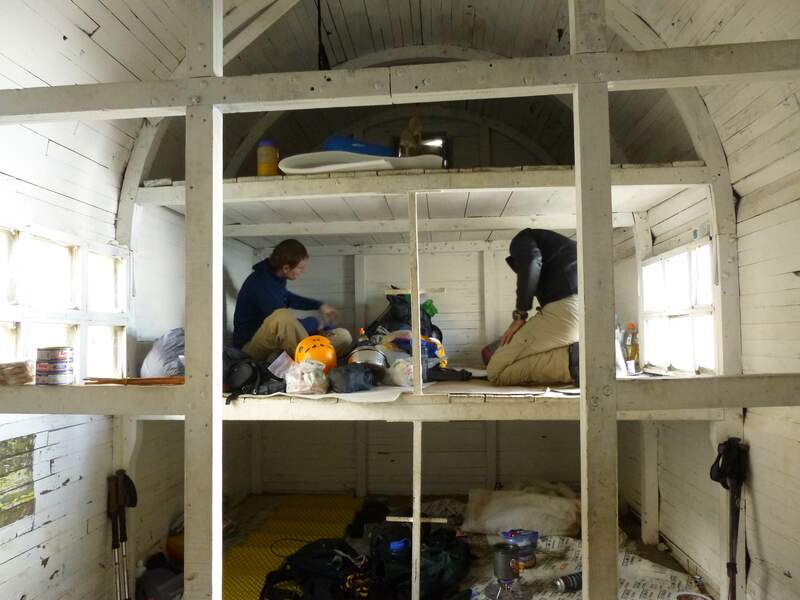 Each half of the hut has three ‘bunk layers’. 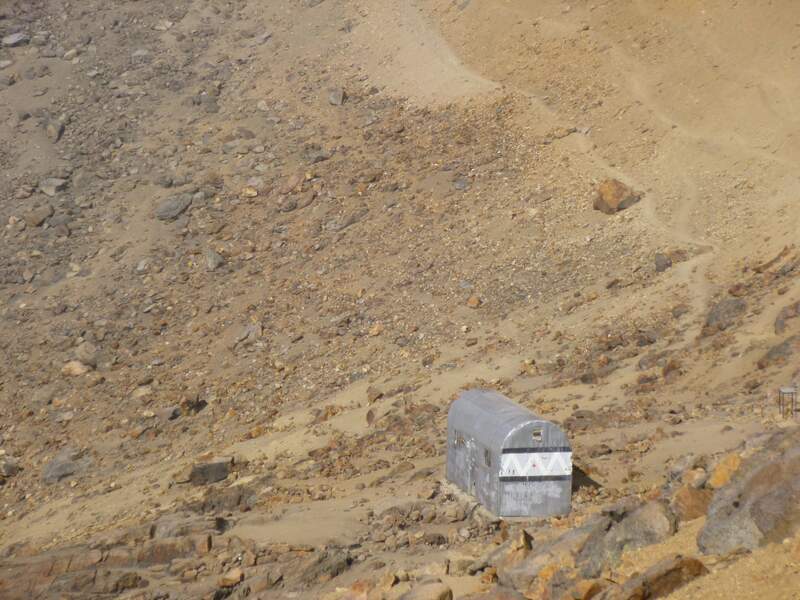 Looking past the hut, a steep scree slope awaited us. A clear usage path followed steep scree upwards. Day 3: We woke up early, ate a fast breakfast, and headed up the scree-covered ‘knees’ towards the summit. 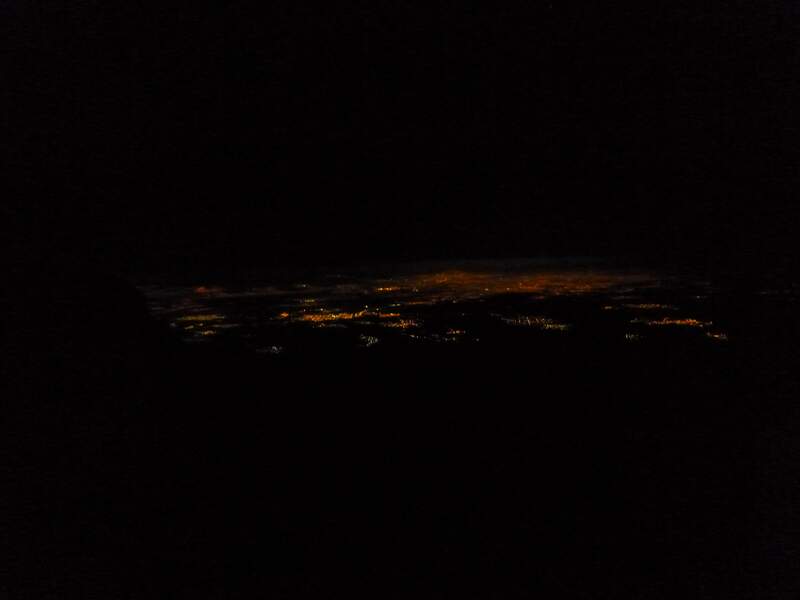 Below, the lights of Amecameca shone brightly. Atop the knees, at roughly 4930m, we discovered the ruins of another hut, long destroyed by weather. 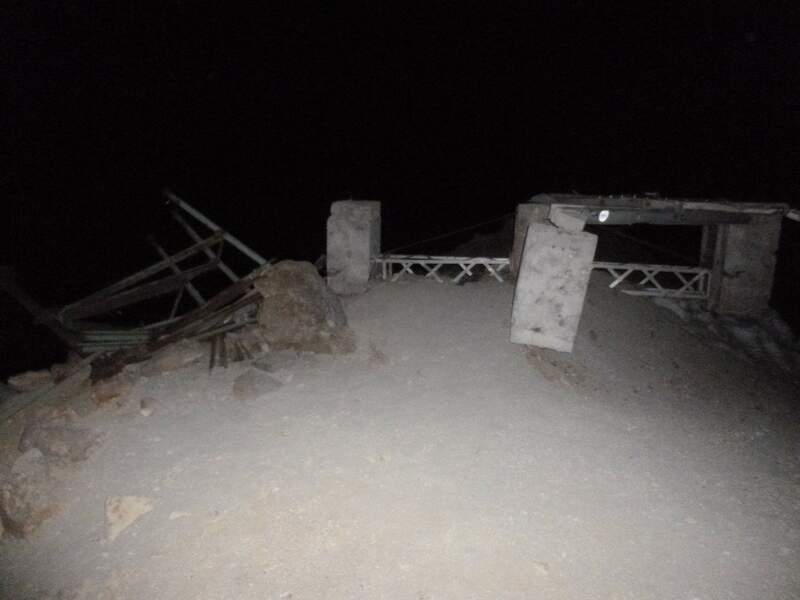 The ruins on top of the knees. 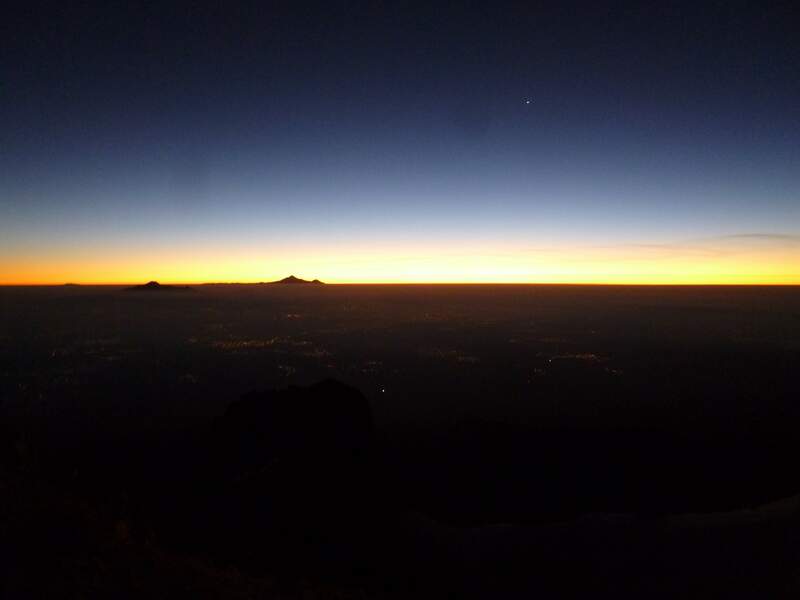 Shortly after we passed the knees the sun began to rise, giving us gorgeous views of Pico de Orizaba in the distance. Sunrise illuminated Pico de Orizaba, far in the distance. 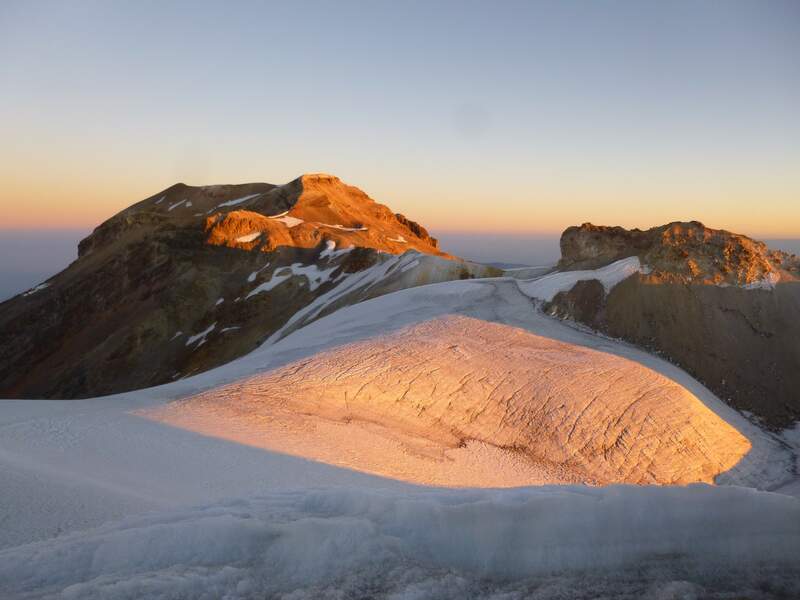 Ahead of us the Ayoloco glacier, Iztaccihuatl’s ‘belly’, glowed in the sunrise. The summit plateau was visible past the glacier. Here we stopped to put on crampons. Probably not necessary for the flat crossing, but the ice was very hard in the cool morning air. 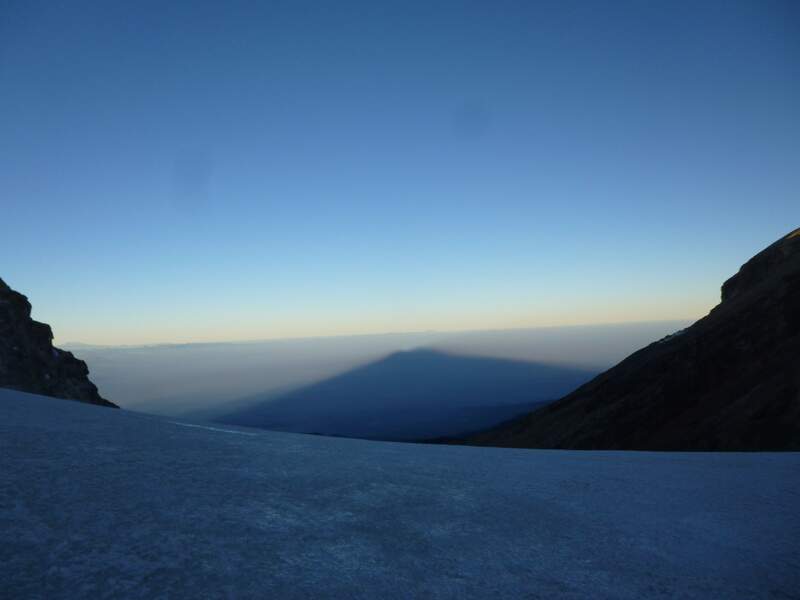 From the glacier, Iztaccihuatl’s shadow stretched over the clouds below. Looking over the clouds from the Ayoloco glacier. Sun cups on the glacier. Looking at the Ayoloco glacier behind us, Popocatepetl in the distance. From up here Pico de Orizaba could be seen in the distance, above the clouds. 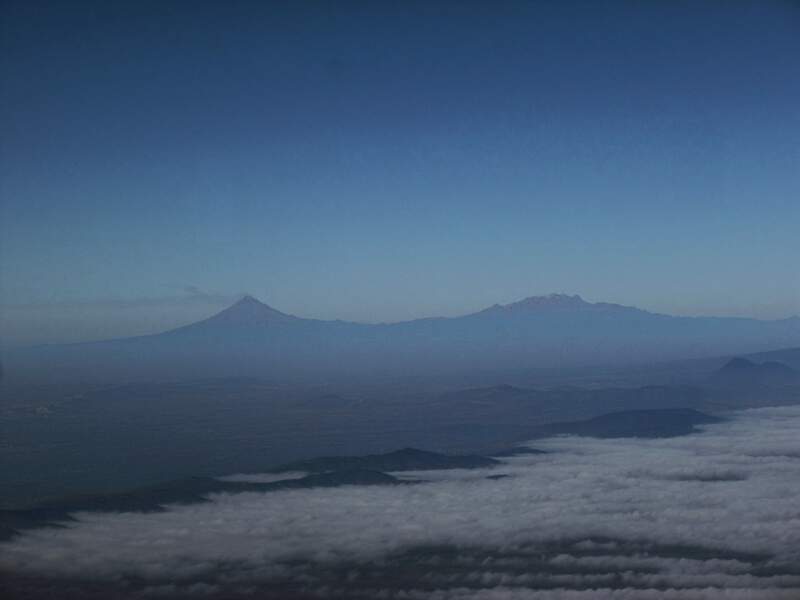 Pico de Orizaba (right) in the morning clouds. Across the summit plateau the summit was visible across a large snow field. Three ridges of similar height ring this snowfield, but the farthest ridge marks the true high point of the mountain. The true summit is at the top of the farthest summit-plateau ridge. After crossing the snowfield, the ridge was an easy walk. From the summit the ‘head’ of Iztaccihuatl was visible below. The rocks of the head had an eerily realistic resemblance to a human face. 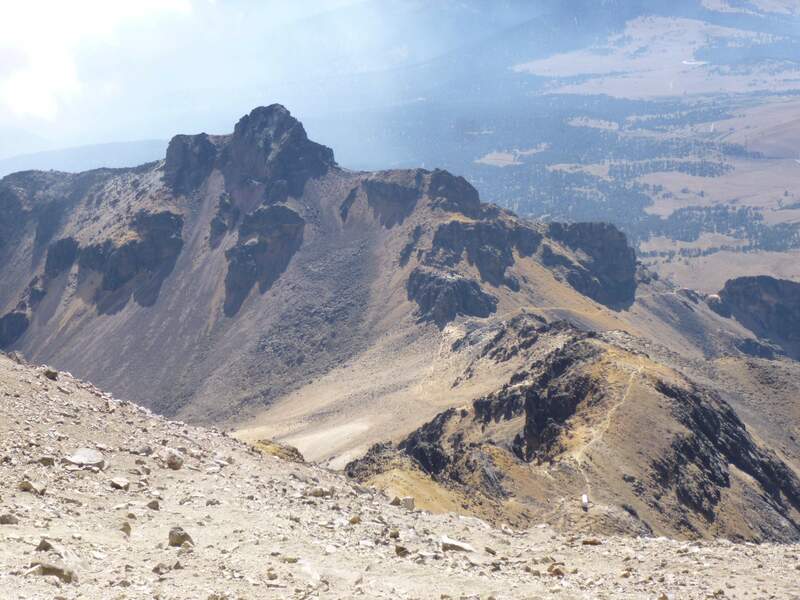 The ‘head’ of Iztaccihuatl resembles a human face when viewed from above. 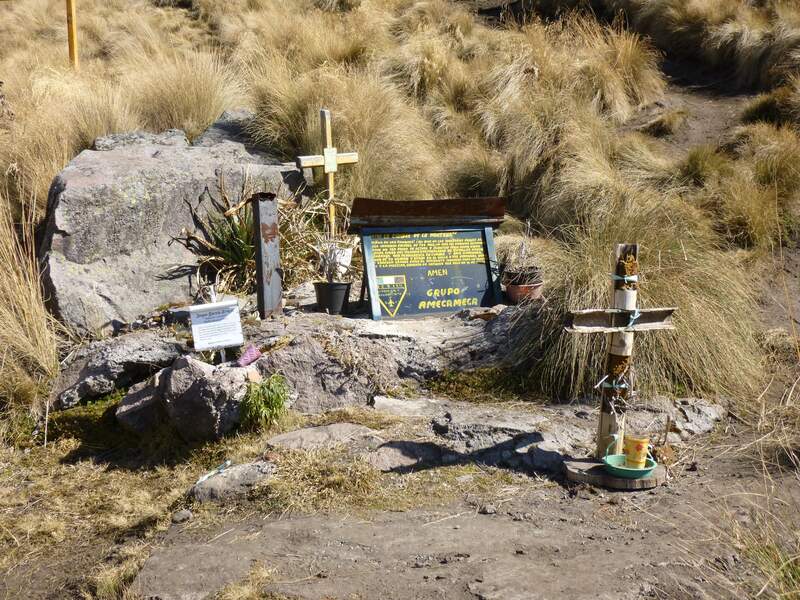 The summit, at 5230m, was marked with crosses and prayer flags. 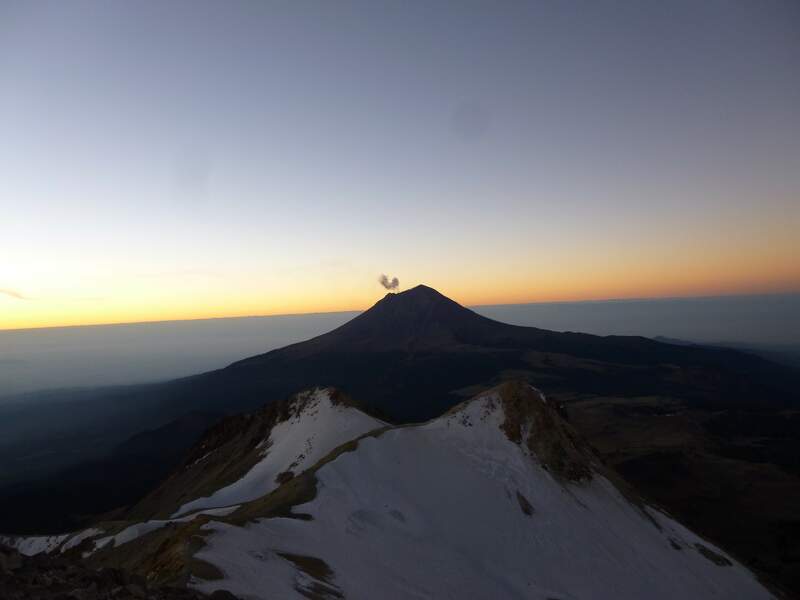 Shortly after we reached the summit, Popocatepetl began to smoke. Popocatepetl smoking in the distance. Below us, an incredible cloud ocean. 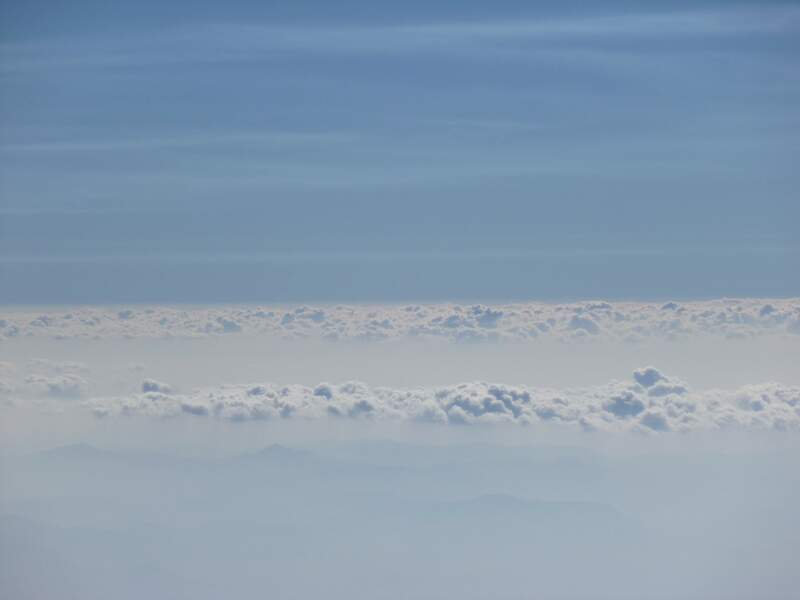 Cloud ocean from the summit of Iztaccihuatl. Descending was much faster than ascending in the dark had been, and we made our way back above the Grupo de los Cien hut without issue. The weather was perfect, and the sunny views very enjoyable. Returning to the knees, the Grupo de los Cien hut below. Popocatepetl had stopped smoking, and we enjoyed a final clear view of it in its entirety. 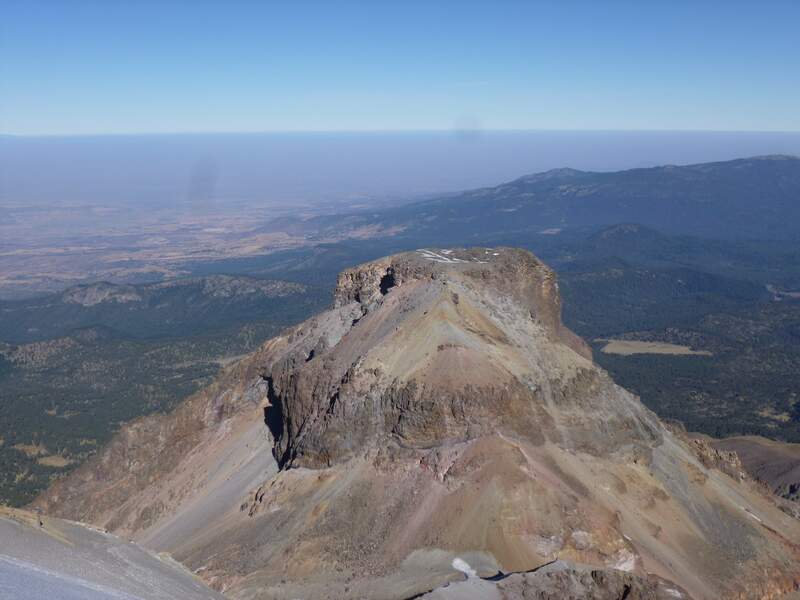 Popocatepetl used to be glaciated, but its recent volcanic activity has melted everything, and it now appears to be a mountain of rock and scree. At the Grupo de los Cien hut we packed up all of our gear, filled a few bags with garbage left behind by other hikers, and had an uneventful descent to La Joya. In Amecameca we celebrated our hike with a dinner of Mexican street food, and then parted ways. I would meet the three Canadians again while climbing on Orizaba, but as we had arranged the services of different lodging/transport providers, we traveled and climbed separately from here on. 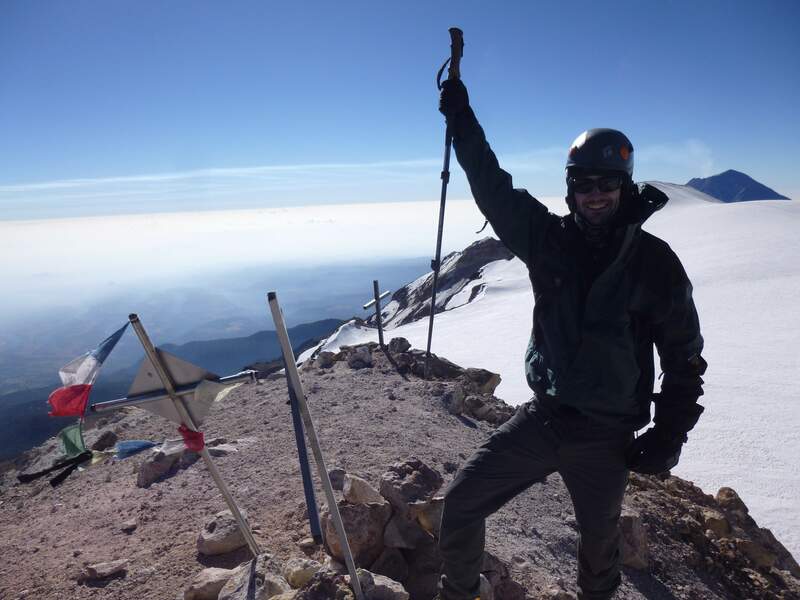 Iztaccihuatl was a rewarding hike. 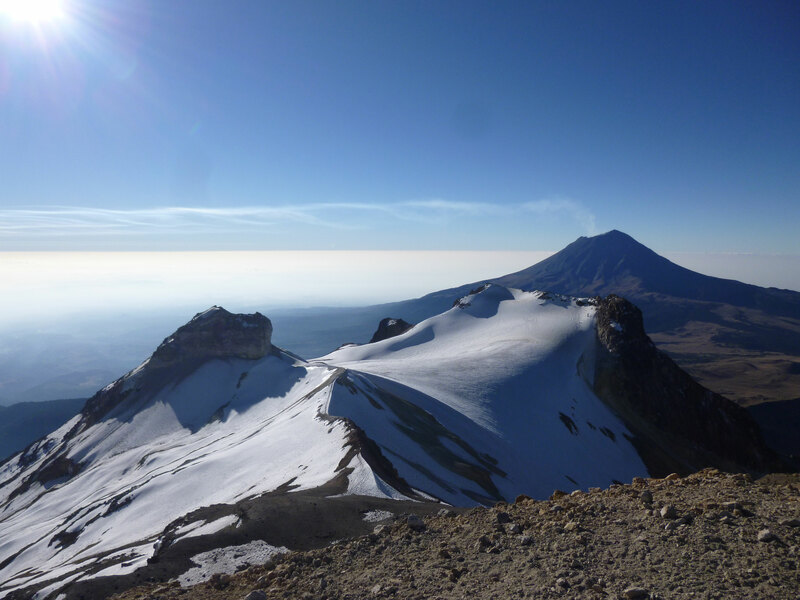 The views of Orizaba, Popocatepetl, and the Ayoloco glacier made for interesting scenery, and the hike itself was enjoyable. 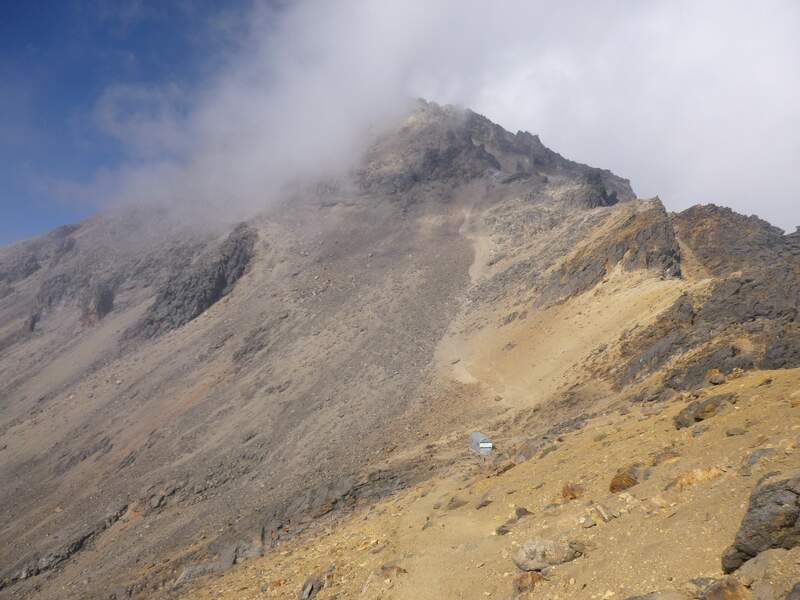 As an acclimatization hike, at 5230m Iztaccihuatl was superb preparation for my Orizaba climb a few days later. 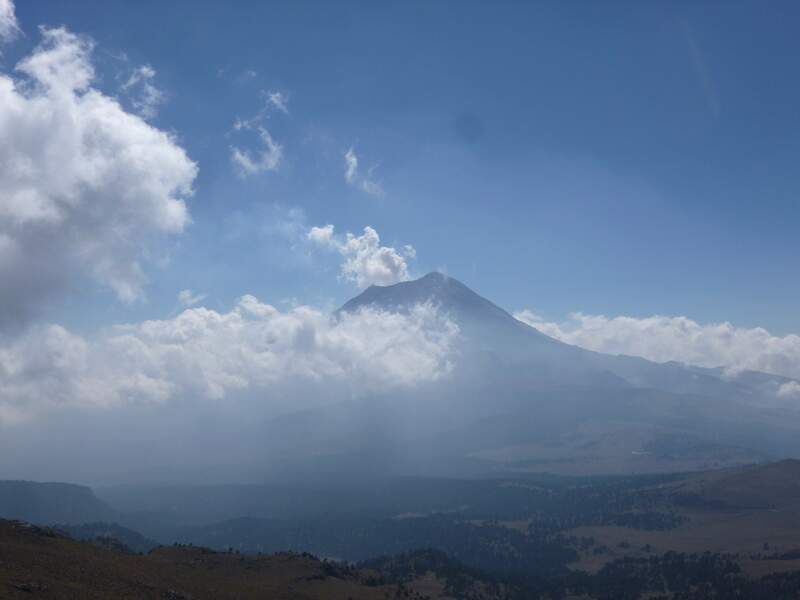 Iztaccihuatl is easily accessible. 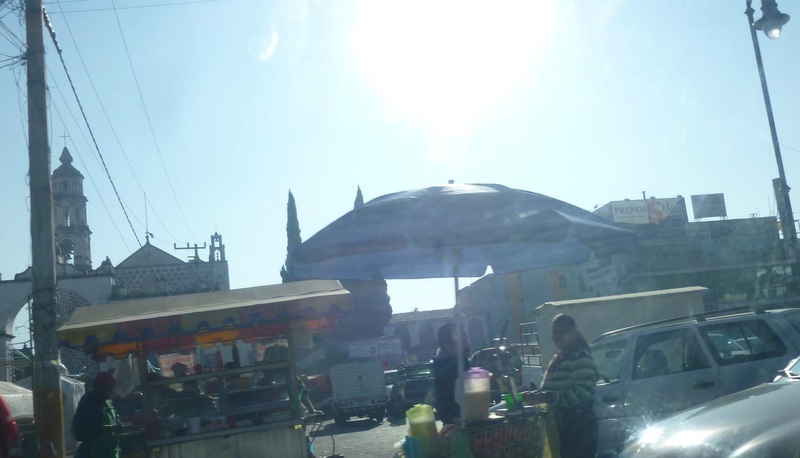 From the Mexico City airport, take an inexpensive taxi to the TAPO bus station. From there, a bus ticket to Amecameca can be purchased via the Sur or Volcanes bus companies. 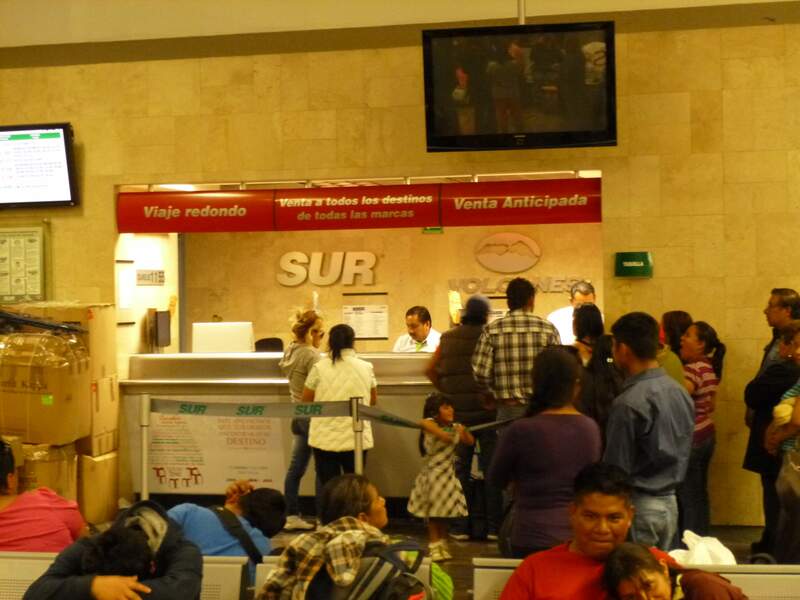 Bus tickets to Amecameca can be purchased at the SUR / Volcanes Ticket Counter in the TAPO bus station, Mexico City. 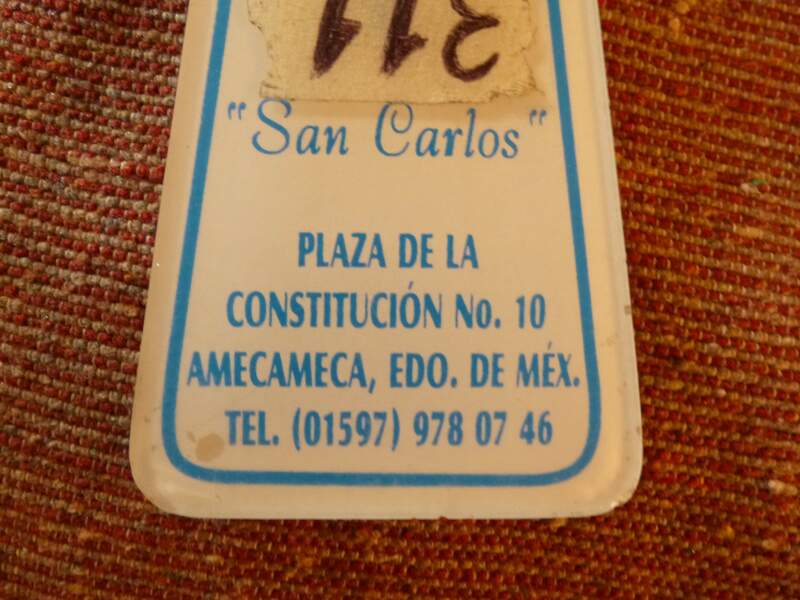 Once in Amecameca, look for the San Carlos Hotel, located right on the town’s central square. In the below photograph, a prominent building is visible to the far left. The San Carlos is located just to the right of this easily found building – its ‘hotel’ sign is at the far right of the photo. The San Carlos is a great place for safe, affordable lodging and luggage storage. The prominent building at the left is a good landmark – the San Carlos is to the right of it. The address, from their keychain. Once in Amecameca, Butane/Propane fuel canisters can be purchased at the Ferreteria, a hardware store just off of the central square. It is bright orange and easy to find. This store in Amecameca is an excellent source for fairly priced fuel canisters. 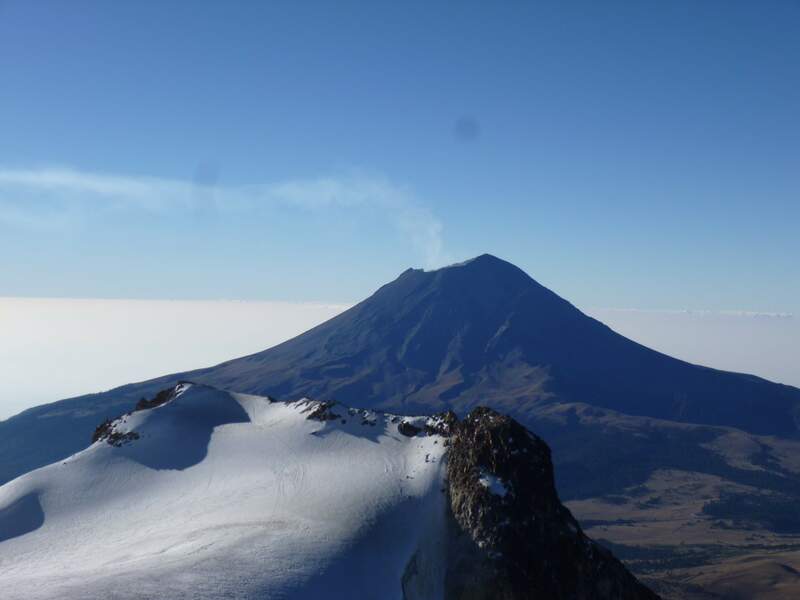 Iztaccihuatl can be climbed year round, but the dry season occurs from November through March, and this is the most popular time to climb. A permit is required to access the La Joya trailhead by car, and to hike Iztaccihuatl. Permits can be obtained at the Izta/Popo park headqurters, near the Hotel San Carlos. A driver to La Joya can easily be found nearby the park headquarters, and I am told that a ride to La Joya from Amecameca costs around $50 USD. Don’t forget to bring a large quantity of water to La Joya – enough for three or four days. 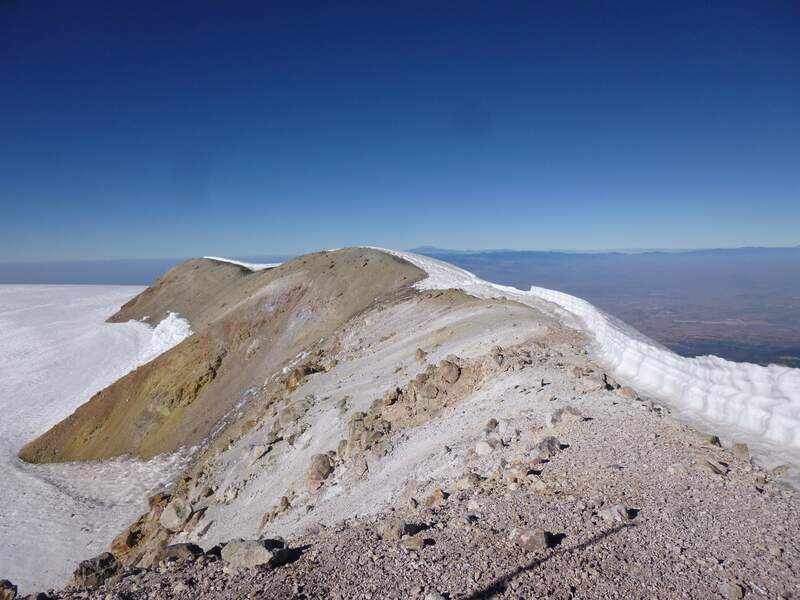 There are no water sources below the glaciers on Iztaccihuatl. 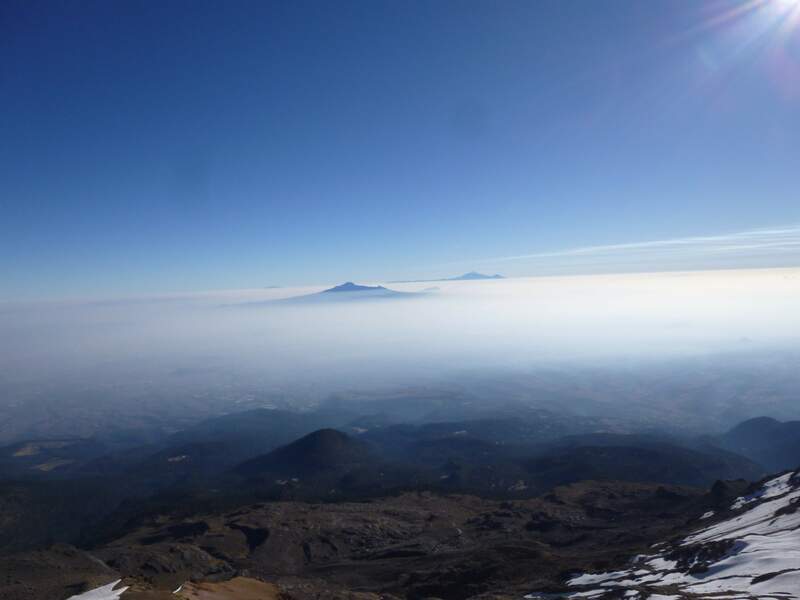 This entry was posted in Hiking, Mexico and tagged Amecameca, Iztaccihuatl, Pico de Orizaba, Popocatepetl by Ian. Bookmark the permalink.